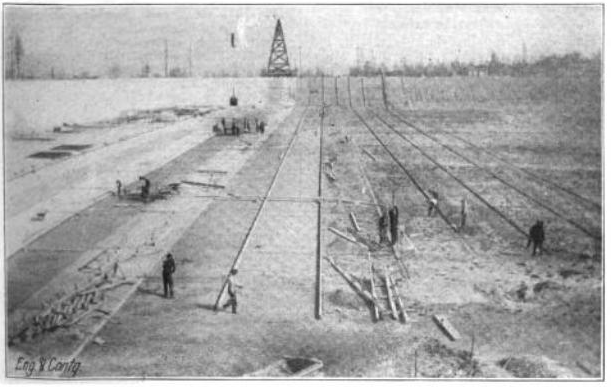 Workers building the Beacon Hill Reservoir in 1911, as shown in an article in Engineering and Contracting magazine. We recently stumbled on a 1912 article in Engineering and Contracting magazine, “Methods Employed in Constructing the Beacon Hill Reservoir, Seattle, Wash., with Data on Labor Required.” It’s a bit technical but some of you might find the details of how the Jefferson Park reservoirs were built to be interesting. Among other details, the article describes how cement, sand, and gravel were bought to the reservoir site by a tramway that carried the supplies up Spokane Street from the bottom of the hill. Want to be a TV producer? Seattle’s public access TV station, SCANTV (Comcast 77/Broadstripe 23) is holding an orientation session on Beacon Hill for those interested in producing programs for SCANTV. The orientation is Wednesday, August 25, from 6:30-7:30 pm at the Beacon Hill Library, 2821 Beacon Avenue South. It is free and open to all, but you need to register in advance by contacting Rita Meher, Community Media Educator, at ritam@scantv.org or 206-522-4758 x104. A neighbor tweeted us, concerned about seeing a “creepy older white male in black parked jaguar on street w/kids”. Be careful out there, everyone. 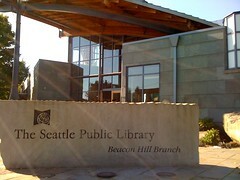 Photo of the Beacon Hill Library by go-team in the Beacon Hill Blog photo pool on Flickr. The Seattle Public Library recently released the results of their recent Community Survey. 33,000 people completed the survey in May, and SPL points out that that is a number equal to 5% of the city’s population. Of those who responded to the survey, 4.4% said that they visit the Beacon Hill branch regularly, and 0.9% visit the NewHolly branch regularly. Beaconians make a bit less use of the “hold” service than average; holds are just over 20% of the total circulation of the branch, as compared to 25% for the system overall (and 34% at Wallingford). The survey asked questions such as “If you had $10 to invest in Library resources, how much would you spend on each of the following? Books and Other Print Resources, Audio-Visual Resources, Online Resources” and “When would you like the Library to offer programming?” The results are interesting. You can download the whole report here. They are currently seeking two specific groups of people for the survey: 1) People who use or have used seattle.gov for a business purpose and 2) Ordinary citizens at every level of computer competency. If you are interested, you can sign up here. The event is at the Jefferson Park Lawn Bowling Club, 4103 Beacon Avenue South. Tickets are $75.00 per person if you buy before August 21 ($40 of which is a tax deductible donation), but the price goes up to $85 afterward. Tickets are available online from Brown Paper Tickets. More info at the seattlebowls.org website. We apologize for the mistaken information. If donating through Chase won’t work, our understanding is that donations can also be made via the KOMO Problem Solvers fund, but when you give, you need to say in the instructions that your donation is for the Sarmiento/Urrea family. A trivial note, but… we noticed today that Google Maps has a new satellite view of North Beacon Hill. The old one, until recently, still featured a giant hole in the ground surrounded by a construction site at Beacon and Lander. The new one shows both the light rail station and the Lander Festival street completed. It looks as if the satellite was flying over our heads earlier this summer or late spring.